These easy-to-make pickles are fresh, crisp, tangy and nicely seasoned. 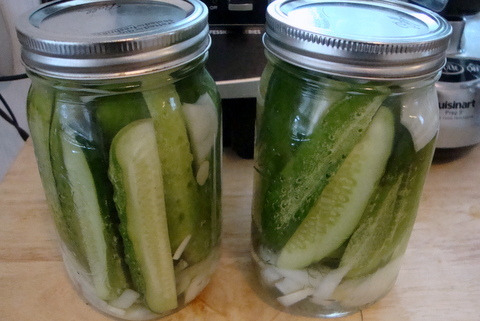 The amount of brine is sufficient for preparing 2 quarts of pickles. In a bowl or large measuring cup, dissolve the salt and sugar in the vinegar and water to create the brine. Add the onion, garlic, bay leaves, dill and optional coriander seeds and pepper to a large container with a lid, or divide among 2 mason jars. For smaller cucumbers, such as pickling cucumbers, leave unpeeled and slice in half or quarter lengthwise. For larger salad cucumbers which have tougher skins, use a vegetable peeler to cut strips of peel away, leaving some of the peel intact. This gives the cucumbers a nice variegated appearance; then cut into ¼ to ½-inch crosswise slices. Stand the spears upright or layer the slices in the 2 jars. If using a large container, lay the spears on their side or layer the slices. Pour the brine over the cucumbers, submerging them completely. Cover tightly. Refrigerate for a minimum of 72 hours, but the longer they “pickle”, the better. Enjoy! A creamy dressing with a South of the Border taste; its’ beautiful pale green color and fresh herbal flavor will brighten up any green salad. Anaheim green chilies are very mild; if necessary, canned green chilies can be substituted for fresh. Place all ingredients except for the cilantro and mayonnaise into a blender. Blend approximately 10 seconds. Pack in the cilantro and continue to blend until smooth. Add the mayo and blend briefly to combine. Season with additional salt and pepper as desired. Pour into an airtight container and refrigerate until ready to serve. Add small amounts of additional water to thin to desired consistency, if needed. 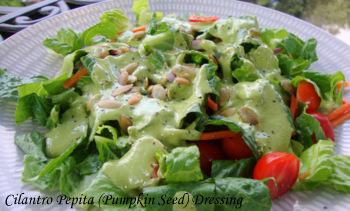 Use additional whole pepitas to garnish the salad before serving. Singapore salad is refreshing combination of fruits and vegetables with a Malaysian-inspired, oil-free, sweet and spicy chili lime dressing. 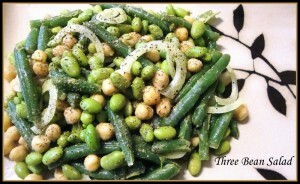 The recipe makes ½ cup dressing, which is enough for 2 servings. 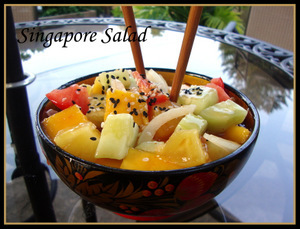 Fresh pineapple is always preferred but if canned chunk pineapple is used, the juice can be reserved for the dressing. The guar gum or xanthan gum is important to this recipe as it adds viscosity to the dressing which helps it cling to the salad. Cut your fruits and vegetables into bite-size pieces in any shape you desire (the onion should be sliced thin). In a bowl, whisk together the dressing ingredients. The dressing may seem thin at first but will thicken upon standing – so resist the urge to add more. This is because when guar gum or xanthan gum are subject to vigorous whisking or shaking in a solution, the viscosity will thin, but will thicken when the solution is left undisturbed. This is called shear thinning, and is a unique property of these gums. That’s why they are frequently used in commercial salad dressings. Toss the salad with the dressing and chill for about 15 minutes to let the flavors blend before serving. Garnish with sesame seeds if desired. Jicama (pronounced hik-uh-mah) is a large, bulbous root vegetable, weighing one to two pounds. Jicama has a rough brown skin which needs to be peeled before eating. The flesh is white, wet and crunchy, similar to a raw potato but with a slightly sweet and nutty flavor. This refreshing slaw is ideal for cooling the heat of spicy Mexican, Indian or Thai cuisine or simply as a side dish on a hot Summer day. In a bowl, whisk together the dressing ingredients; set aside. 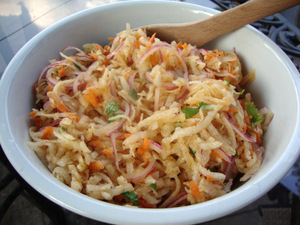 Place the shredded jicama, red onion and shredded carrots in a large bowl. Pour the dressing over the jicama mixture and toss to coat well (you may not need all of the dressing; just add enough to thoroughly coat the mixture). Fold in the cilantro. Refrigerate until thoroughly chilled, allowing the flavors to merge together.